Hi, how are you today? I’m fine, you know, surviving the sudden blizzard, rocking some Boubacar Traoré, and…oh yeah…wait…not fine at all – eating puréed lentils!!! Gentle reader, (is that phrase trademarked? can I use that?) because I lost my mind for about five minutes and decided that lentil soup was fine, but puréed lentil soup would be better. That it would be creamy and soupy and wintery and delightful. It is freaking baby food, gentle reader. Baby food. And if you’re into that kind of thing, I have the recipe for you! But the rest of us will be over here, eating a hot, steaming plate of ANYTHING BUT THAT. So what inspired this moment of madness? Why did I take a perfectly decent pot full of lentils and turn it into a green slushy? Because I had made a smoothie that morning, and the immersion blender was sitting RIGHT THERE on the counter. I seized it without thinking and before I knew it, green baby food. 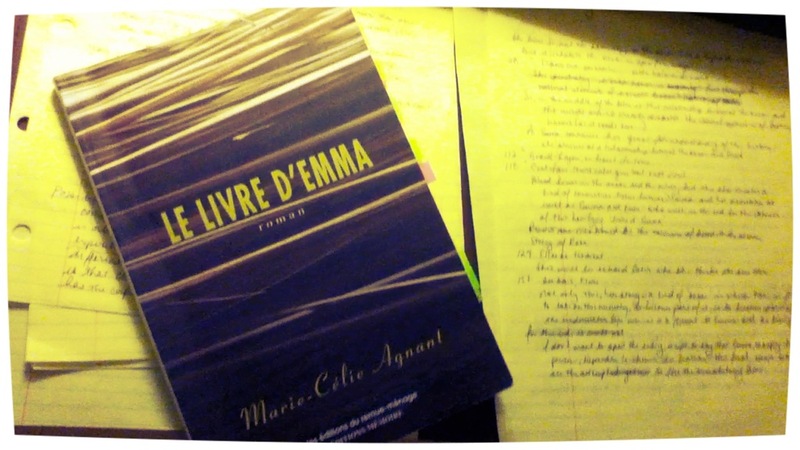 I am writing on a perfectly wonderful novel, Marie-Célie Agnant’s Le Livre d’Emma. (It’s available in translation as The Book of Emma.) And because Agnant is brilliant, everything that could possibly need to be said about this text (especially in eight page format) is already in the text. A close reading could really say everything that I need to say about the intergenerational collective trauma of the Atlantic slave trade and the Middle Passage, the resonance of this trauma in the contemporary Caribbean world, and the ocean as the basic intertextual signifier of traumatic history and memory. Let me repeat. It’s…already…there…you don’t need a language to talk about the trauma experienced by the novel’s eponymous character because it already has a language. Marie-Célie Agnant wrote it. So, this is where my comparison breaks down because, obviously, using an immersion blender and ending up with baby food is quite different than using trauma theory and coming up with a sizable chunk of (albeit rough) dissertation work. My point is, “because it’s there” is not a good enough reason to purée your food, or to use a theoretical framework. A smart person who shall remain nameless once told me that if you’re gonna bust out the theory, it’s because you can’t get where you’re going without it. (This unnamed person did not use the phrase “bust out the theory”…) It has to be ‘necessary,’ not just ‘possible’…(you guys know who I’m talking about now?) Meaning, you can’t just grab it because it’s there and throw it into your analysis. What you have in front of you – you know, the text – may be perfectly clear the way it is.